Home / Unlabelled / OSODIEME: Chief Mrs. Ebelechukwu Obiano’s Support Excites Igboezunu Anglican Women. OSODIEME: Chief Mrs. Ebelechukwu Obiano’s Support Excites Igboezunu Anglican Women. The joy of the Holy Trinity Anglican Women Igboezunu Ivite Aguleri knew no bounds Friday following the pledge of support by the wife of the Anambra State Governor Chief (Mrs.) Ebelechukwu Obiano in their quest to build a befitting Parish house for the reverend ministers and pastors in their community. 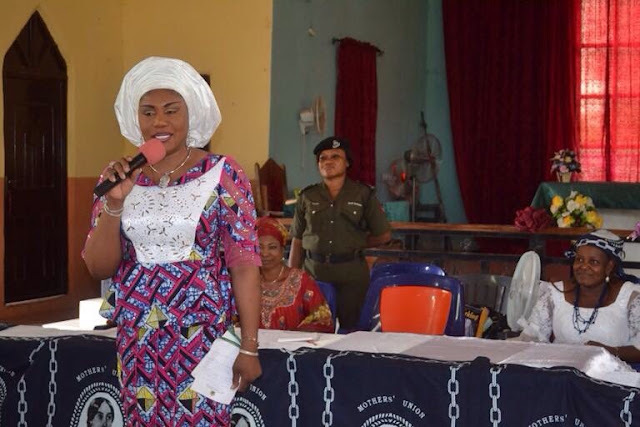 Mrs. Obiano made the promise when she joined the women at the 2016 August meeting in the course her visits to similar women groups in communities across the state. The governor’s wife also assured the women that their appeal for construction of Igboezunu ivite aguleri access road and request for electricity will be brought to the attention of the government for consideration in order to ease the suffering of the people of the area. She however told them that she is aware that government attention to roads across the state will continue in earnest once the rains subside. The governor’s wife appealed to the women to continue in their support for the efforts of the governor and his team so that they can sustain the achievements in agriculture, good roads and infrastructure like the Awka flyover, quality education for the youths and ensure the successful completion of the N20million project earmarked for each of the 179 communities in the state. Furthermore, Mrs. Obiano informed Igboezunu women that her NGO Caring Family Enhancement Initiative (CAFÉ) is a vehicle for empowerment for women especially indigent widows, the less privileged and promotion of the total well-being of the family. She enumerated some of the projects by CAFÉ including Housing for Indigent Widows, construction of market toilet in rural communities, provision of water bore holes and various Skills acquisition training which has given over two thousand women means of daily bread and called on them to take advantage of the programmes. Earlier, the President of the organization Mrs. Blessing Udogu described governor Obiano as God sent to Ndi Anambra for providing security in the state which has made various ceremonies and meetings possible without any form of threat to the citizens, and promised the support of her members to his administration. Mrs. Udogu also appealed for assistance to construct a house for their reverend Pastors, access road and provision of electricity to the area to ease their suffering. In the same vein, Mrs. Ukwuoma Nweke in a vote of thanks, commended the governor's wife for her benevolence and appreciated the governor for regular payment of salary and gift of rice to civil servants end every year and wished them a smooth transition to second term to in office. We thank her excellency for her worthy representation at all time. We hopefully hope to receive such a good visit as well.